I’m back! I’ll leave my absence unexplained but let’s just say it involved espionage and sports car chases through exotic locales. It was definitely not due to tax preparation. Those colours are a bit brighter than normal. Guess who has two thumbs and recently discovered all the settings on her new camera? This girl! Try to find something this nice at Walmart for ten bucks. You ever hear the expression “the real McCoy”? Well, that’s actually a very old Scottish saying and nothing to do with pottery at all, but it does serve as a memorable warning about McCoy knock offs. The brand is so popular that newly made reproductions have been found in many styles. Collectors who buy pieces worth hundreds or even thousands of dollars must carefully inspect the mark and the quality of the clay before purchase. The marks varied throughout the years, and some items were never marked in the first place. Marks can be convincingly replicated on reproductions, but what is harder to replicate is the heavy clay used in real vintage McCoy. 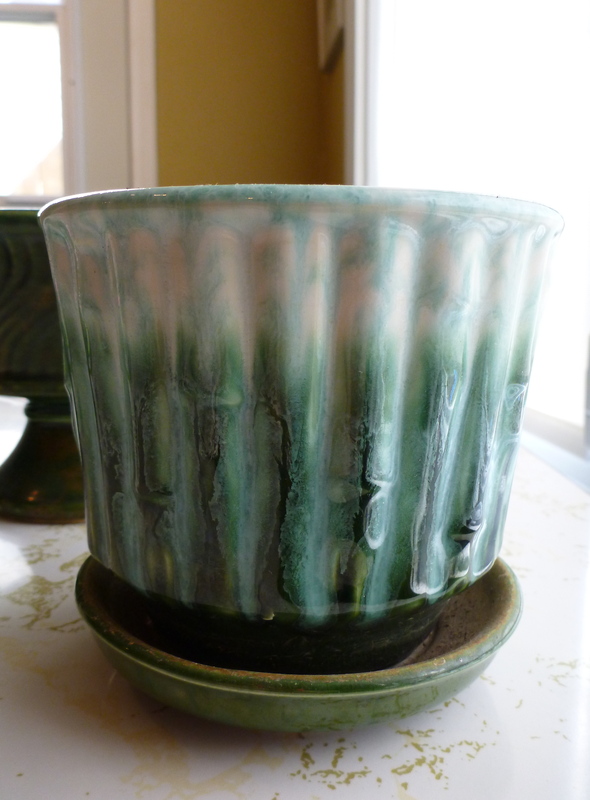 New pottery is more brittle and less dense. 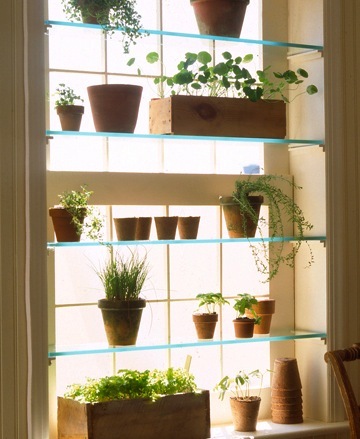 The glazing might not be as expertly applied, or cover the proper amount of the surface as well. In general, the knock offs look and feel cheaper than their authentic counterparts. Try to get your hands on some real ones and inspect them carefully to know what feels right. You can see the variety of McCoy marks on even this small selection of items. Chiquita’s McCoy Pottery – Chiquita likes McCoy a LOT. 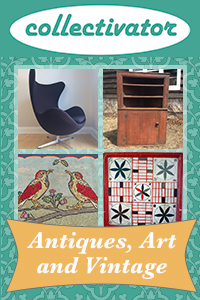 Great photos of her vast collection, as well as collecting tips and historical information. 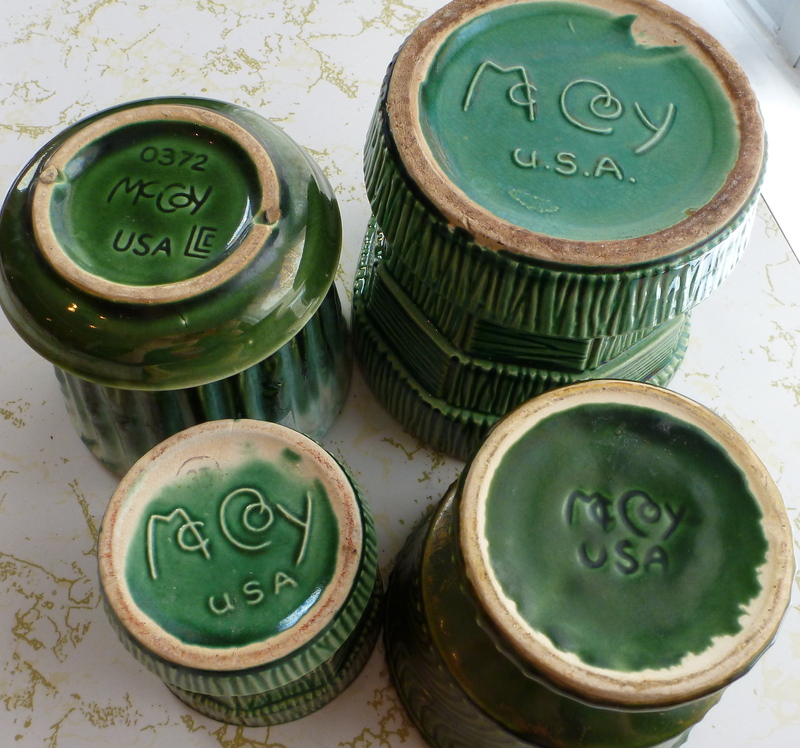 McCoy Pottery Online – Marks, history, photos, auctions and all things McCoy. great new post, new collector.. Especially helpful giving the identification links. 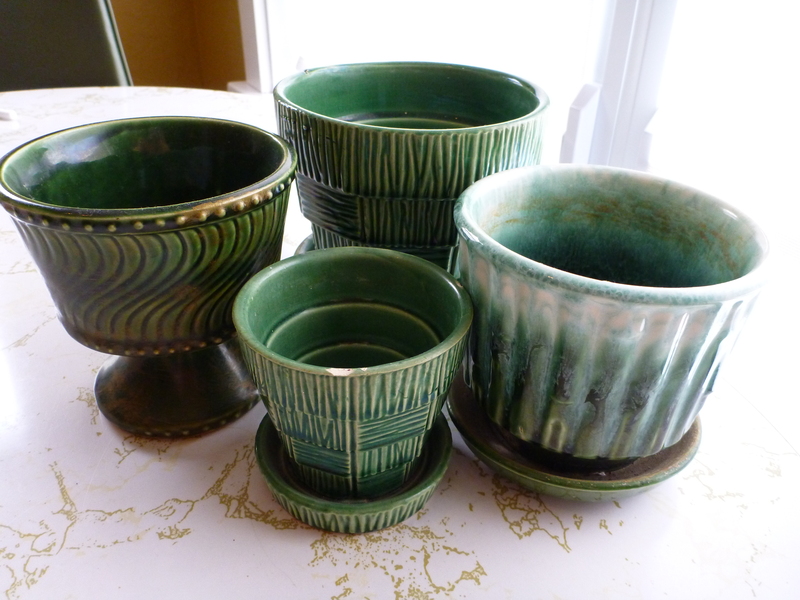 These lovely and useful pots are one reason it can still be worth stopping at a yard sale or Sally Ann shop. There’s still lots of them around and you can get lucky. I will definitely be expanding on my collection in future entries. Thank you for your comments! I have a vintage flower pot & curious what it’s worth. It is 4″ high & the opening is 5 1/2 “. 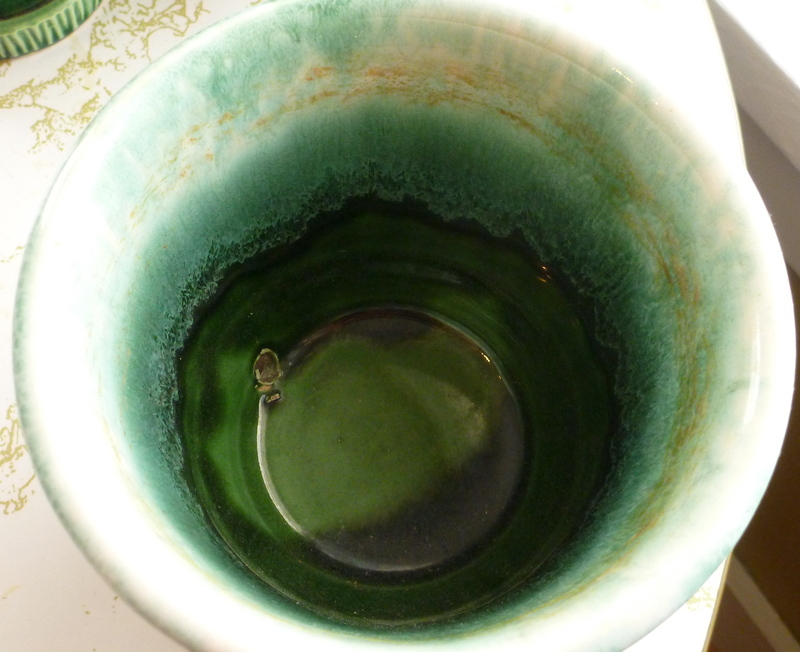 It is lighter green than the ones on your web site & has leafy detail around the outside. The botton is stamped Mc Coy USA. Hi Shelly! I’m sorry I can’t appraise your item. 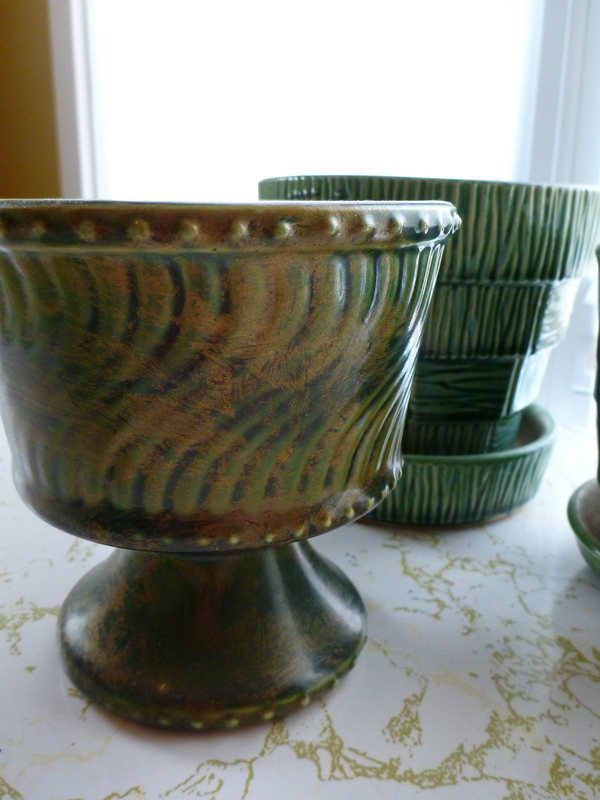 I would check the websites I mentioned in this post (McCoy Pottery Online especially), and the completed ebay auctions to see if something similar sold and at what price. Good luck! In the early 1950’s, my mother bought 2 beautiful, shiny flower planters. I have no idea who they were made by. I am hoping someone can help me for I would love to have one or even a photo of one. It was a bird nest on a tree limb with a bird sitting on the limb. I think there was a blue jay on one and a robin red breast on the other planter. Thank you! Thank you for such a well-written article on McCoy planters, I think the collectible value of these is really unappreciated today, but the entry-level cost to get pieces is one of the best features. 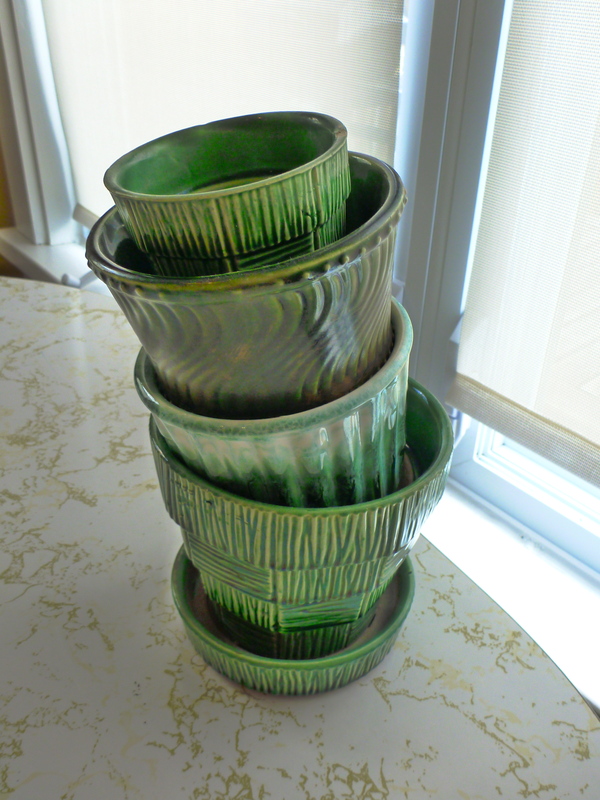 There are great deals out there on McCoy pottery planters, and anyone can have a great collection with a small budget and a little effort. Thank you for such a nice comment, and I totally agree. The typically low cost is a great incentive to start collecting.